Qualified licensed practical nurses are needed across the state of Louisiana. According to a report from the Louisiana Center for Nursing, the state will experience a shortage of LPNs through 2020 in a number of locations including Baton Rouge and New Orleans. Research found that the most difficult LPN positions to fill were in psych hospitals, long term care/skilled nursing facilities, and home health; however, a number of vacancies are expected in almost every nursing area. With this shortage comes opportunity for those interested in launching a career as an LPN. If you’re thinking about exploring this field further, this guide will walk you through state licensing requirements, take a look at Louisiana’s LPN salary and employment landscape, and provide a search tool to help those who are ready to start browsing LPN programs in Louisiana find the best match. Ties are broken based on lowest average net price for full-time, first-time undergraduates paying in-state tuition (average cost of tuition and expenses after grants and scholarships). Licensing of LPNs in Louisiana is overseen by the Louisiana State Board of Practical Nurse Examiners. This section offers information on the state’s requirements for initial licensure and renewal. Louisiana requires all LPNs practicing within its borders to have graduated from an approved LPN diploma or degree program that includes both classroom education and supervised clinical experience in patient care. Such programs tend to last about one year and coursework will include subjects such as nursing fundamentals, basic pharmacology, basic nutrition, physiology, and medical/surgical nursing. Students should confirm that any LPN programs under consideration are fully accredited by the state and that graduation from the program qualifies them to sit for the NCLEX-PN examination. The Louisiana State Board of Practical Nurse Examiners provides a current list of approved PN programs in the state. An applicant from another state who is already licensed can obtain an LPN Louisiana license if: 1) the current LPN license is current 2) he or she meets the other requirements for licensure in Louisiana; and 3) he or she completes all necessary forms for application and pays the specified fee. A temporary permit to practice as an LPN may be issued to a graduate of a practical nursing program in Louisiana if: 1) the individual’s application for licensure by examination has been completed and submitted, along with payment of the appropriate fees, and the application is approved by the board; and, 2) the applicant’s transcript is submitted by his or her school, and the transcript is approved by the board. Any temporary permit issued will expire eight weeks from issuance, the date of full licensure, or on the date of receipt of notice of failure of the LPN exam, whichever comes first. All Louisiana LPN licenses expire on January 31 of each year and must be renewed annually on or before that date. Renewal requires timely submission of an application and payment of the $50 renewal fee. There are no Continuing Education requirements for LPN license renewal in Louisiana, although some employers may require CEs as a condition of continued employment. Failure to renew one’s LPN license will result in assessment of a late fee to be paid along with the normal renewal fee. Licenses that are delinquent for one or more years will be subject to payment of all fees for the years of delinquency. How much any individual LPN will earn in Louisiana depends on several factors including geographic location, job title and responsibilities, specific employer, and experience. The tables below provide salary information for practical nurses in Louisiana. Salary amounts do not offer an accurate indication of job concentration for LPNs in Louisiana, and while strong job growth is forecast for nurses in the state for the next several years, that does not mean that growth will be distributed evenly throughout its regions. The following data provide a closer look at where LPN job growth is expected to be the strongest, and also offers more detailed insight into the field. Located in Lafayette, the ABNA’s mission is to, “… serve our community by providing a forum for black nurses to advocate and implement strategies to ensure access to the highest quality of healthcare for persons of color.” Open to all nurses regardless of race or color. The HCLA is a non-profit organization that advocates home healthcare providers throughout the state through events, education, membership networking and more. 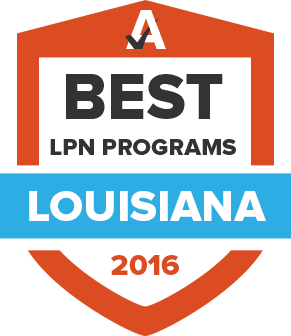 The LASN offers a wealth of benefits for its members, including information on Louisiana LPN programs, schools and faculty, scholarship opportunities and more. The association’s newsletter can also be accessed online. Established by the Louisiana State Board of Nursing, the LCN provides a clearinghouse of information and statistics for the state’s nursing workforce. Affiliate of the National Association of Licensed Practical Nurses. The LFLPN offers its members a number of services including continuing education opportunities, networking with fellow members and certifications for intravenous therapy and gerontology. The LHA is a not-for-profit association of Louisiana hospitals and healthcare systems that provides an array of services and resources to its members. The LSNO’s 300 members serve over 750,000 Louisiana students. The LSNO website provides information on a variety of relevant topics, including legislative actions, certifications and professional development, as well as continuing education and other education opportunities. The LSBPNE is the official state agency for licensing of LPNs in the state. Check here for licensure requirements, license renewal, professional compliance rules, and more. The LSNA is a non-profit organization that advocates for all nurses regardless of practice setting or specialty. An affiliate of the American Nurses Association.